So usual sharing of pretty colourful graphs. Thought last part would take ages because there wasn't really anything left to write, except some closing comments, but I had it all less 500 words done by breakfast. 4750 words to go but sure there's another story. We've just had the big fight, and it seems you can't resuscitate a ghost with jumper leads. Not a selkie ghost anyway. Hopefully there's still lots of "wrapping up" to write. Not really 10K of story left, although I'm sure characters intend to spend all that sititng around wondering how to find the werewolf and arguing what whether they should. Something needs to happen to jolt them along a bit. Today finds me at 32665 words. Writing at just 2500 words a day has confirmed my thoughts about writing processes, and writing faster. I'll have to make some notes. Gah. I think I will restrict myself to 2500 exactly for the next 10 days. I know this. I know it. It took me too long to learn it but I KNOW it. Admittedly I haven't had much use for it in recent years but that's no reason to forget. When characters are digging in their heels and not doing what I want, I have to stop and work out what it is they want. So, having rediscovered that writing "wheel" this morning, today was much easier despite being away all day. Total word count: 20111. I've finally worked out what is going on with this Nano novel! It's trying to make my other WIPs look better by comparison. 16700 words. That's 1/3 done. Also where the turning point (aka end of Act 1) should be. Which is what SHOULD be happening in the next scene for the present day story line and it's getting closerfor the past story line so it's actually sort of working as a plot. Who knew! So my "2500 words a day" didn't last long. I am sticking to 3000 words a day though. Yeah, those word counts actually give a daily average of 3335, which rounds down to 3000. I have no idea what I am writing next though. One main character, Joe*, doesn't want to be dragged off into the bush and turned into a werewolf. So I'll have to try a less obvious approach. The modern day characters are more interesting in wandering around museums than advancing the plot, but they have finally obtained their stuffed penguin. There is no plot reason for them to acquire a stuffed penguin but it was a condition of including one of the characters. I'm not sure that is how this writing things is supposed to work. On the positive side, we had our first local write-in today, and it went well. *I said to him, if you won't give me your name, I'm calling you Joe. His solution to that is to turn the POV into first person. Gah. I finish my 2500 words for the day, and it's the middle of the afternoon and if I get to 3000 I can have another lollipop. So I put some numbers into the spreadsheet and work out it wouldn't hurt to do some 3K days. So I do that, and now I have 5640 words total. Which is an ugly number. 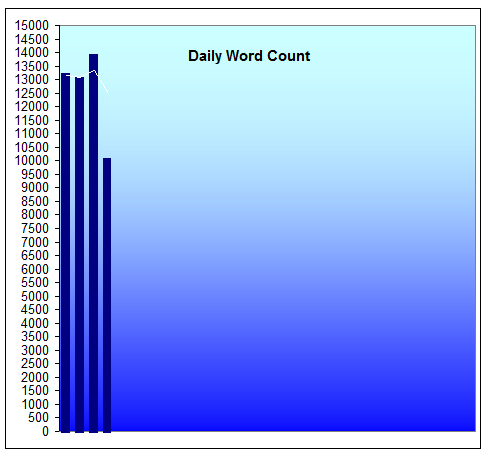 6000 is nicer, and it's about 300 words away, and that will only be an average of 3K per day. So I'll do those extra few words. And then? I have encountered a problem. The first few hundred words each day are hard, but by the time I reach 2500 words, the writing is easier but there I have to stop. There are local write-ins arranged throughout the month so I don't want to finish too soon and as I am only doing 50K this year (That is 50000 exactly. Not a word more) I'm working on just 2500 words aday (+-10% to allow for end of pargraphs.) But I want to write more, and there is this nice, almost empty long weekend too. Meh. Whatever you do during the day, if it's work, school, play, kids, find a few minutes first thing in the morning to type up a few lines. It doesn't have to be a lot, just a sentence or two, or a paragraph. Then later in the day when you do have time to write, it'll be much easier if you're not looking at a blank screen. And you won't be thinking "2000 words to write tonight and I haven't even started". Because you'll have started! And yes, I said 2000 words. You only need 1700 words a day (well OK 1667 but that's an ugly number) to get to 50K by the end of the month, but if you can those extra few hundred each day, you'll have a buffer in case you need a take a day off or something goes wrong. Also, it is much easier to keep motivated when you're ahead of the game, rather than just managing to keep up or behind. Once you get behind it's harder. One things many experienced writers will tell you is it's not writing they enjoy as having written. The thought of having to sit down to actually type out words IS off-putting, especially at the end of the day when you're tired and it seems so much easier to just sit and watch TV... Once you actually have some words on the paper, the rest will be easier. Gather some friends who are also doing Nano. Set a timer for 10 minutes. At the end, see who has written the most words. Repeat. Set a timer for 10 minutes. At the end, see if you wrote more words than the previous time. Repeat. Set a timer for 10 minutes. Write. It doesn't matter if you're competing against other people (and if you are, you actually wins) as long as you do nothing but write for 10 minutes. No looking at Facebook. Or a quick check to see what that email that just came in is about. Or talk with whoever else is in the room. Or watch TV. You can do all these things at the end (it's your reward). Get the hang of doing this, and your productivity will go up. It helps avoid procrastination. (It's only ten minutes, that's no big deal). It helps focus your brain on the job at hand. When you're done for the day, update your word count and tell people. If you're finding it hard, tell people. It can get hard. Read those motivational emails you've been ignoring and you'll find there are times when it's hard for everyone (even those people who write 200K in November find it hard at times). If you need help, with anything from thinking of character names to plot problems to hating your writing and wanting to delete all evidence of its existence, talk to people. It's the social aspect of Nano that makes it work, so make use of it. Set rewards for reaching certain word counts. A small rewards for each 1000 words (a bit of chocolate, a cup of tea, listen to a song, play a game for 10 minutes). A slightly bigger rewards for every five thousand words (ice creams, an episode of a TV show on a new DVD or a chapter of book, a new game for 30 minutes, go shopping). Decide the rewards before you start, and you get it iff you reach the goal. Yes, that adds up to 50K. Yes, I'm showing off. I don't think I'll be doing this again (and 4 days is definitely the limit). Back into it tomorrow. Last year, come November I sat down to do the 50,000 words of Nanowrimo and finished it in five days. This year, just to prove to myself it wasn't a fluke, I did it again. In the process, I learnt about how I write and I want to see if I can share some of that. Work out what to write in the next scene, usually about 1000 words worth. Sit down and write this. Work out what to write in the next scene. My actual writing speed was fairly consistent (1000 words an hour/100 words per 3 minutes). 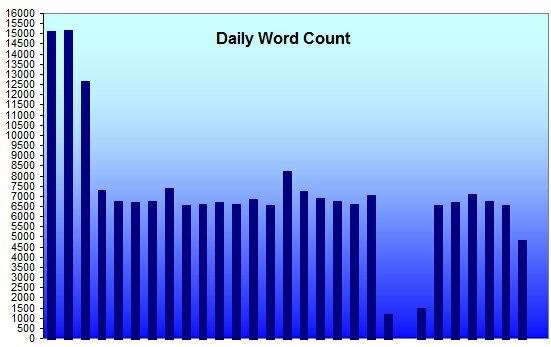 Over the years, my daily average improved, and I was getting 3000-5000 words a day, with an occasional higher day when the story wanted to be told. I knew my limit. Those higher days drained me mentally and physically (my fingers HURT). To write 10K a day, I'd have to type from when I woke up until I went to sleep, with no substantials breaks. I might manage it one day but sustain it? No way.